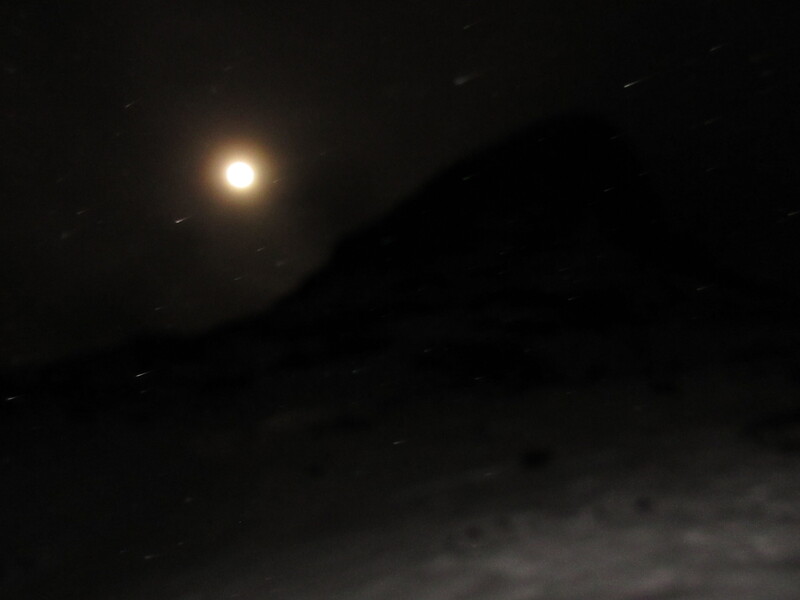 LITTLE over a day into a new year and I was standing high on the slopes of Beinn Alligin howling at the full moon. Or, to be more precise, I was howling at where the moon had been just minutes earlier before it was swallowed by cloud. Now before you start thinking I have finally lost the plot completely, let me explain that this was the start of a new book project, Mountains of the Moon. This involves being on or around an iconic Scottish mountain on the night of every full moon in 2018, and this year there are 13. So that's 13 moons and 13 mountains. Sounds easy enough when you say it quickly. But this is Scotland and the chances of landing lucky with the weather range somewhere from zero to impossible. I'm sure there will be some exceptionally stunning walks, but they are likely to be the exception. A one in three success rate would therefore be a triumph. I have tried to choose mountains which complement the named moons, hence the reason I was climbing Beinn Alligin at 3am on January 2. This was the night of the Wolf Moon, and legend has it that one of the last wolves in Scotland was hunted down in its lair in the corrie, Toll a' Mhadaidh Mor (big hollow of the wolf), and killed along with its cubs. I wanted to head into this corrie and explore by moonlight. And, of course, howl at the moon, a sort of wolf tribute act. I reckoned I would be the only wolf there that night. I would imagine that anyone in the vicinity would have felt a shiver down their spine on hearing wolf howls coming from the mountain. Especially any red-cloaked small child taking a picnic basket to their granny as a first foot. While the walk was mostly a success, the whole outing highlighted a lot of the problems I will face over the year. Timing is everything, and striking it right is going to involve meticulous planning, but mainly a lot of good fortune. 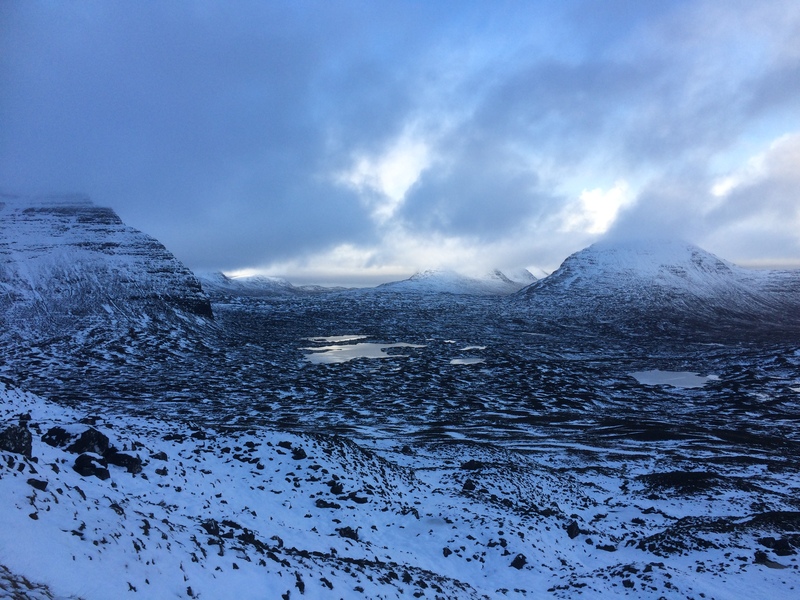 The forecast was for a good, clear weather window in Torridon from late on the 1st until around just before dawn when a stormy, wet westerly front would be sweeping in. I had the use of a cottage in the glen from midday on the 2nd, so I set off early on the evening of the 1st under clear skies and freezing temperatures. For most of the drive up the A9 I was accompanied by the full moon, but when I turned on to the road to Achnasheen it all changed. The Torridon tops were obscured by cloud, the moon's faint glow the only hint to its whereabouts in the sky. Beinn Alligin was invisible in the blackness, but after about an hour of sitting in the car the moon made a comeback, breaking into clear skies and illuminating the slopes. It was time to go. The first hour was like walking in daylight, but as I rose into the snowline and neared the entrance to Coir nan Laogh, the cloud closed in again, the snow came on and the moon was reduced to a fading cinder before being cut off completely by the bulk of the dark buttress on my left. Suddenly I was engulfed in darkness, the only light the snow underfoot and the laden walls ahead, sweeping up menacingly into nothingness. I decided then I would be satisfied with a traverse across the big corrie and a bit of howling. The sunrise was equally disappointing but at least I got back ahead of the impending downpour. I sat at the waterfront in Shieldaig, grabbing 40 winks as the wind and rain lashed the windscreen. I slept well that night. A pity really, because as I later found out, the moon was at its best above Alligin early next morning while I was still unconscious. 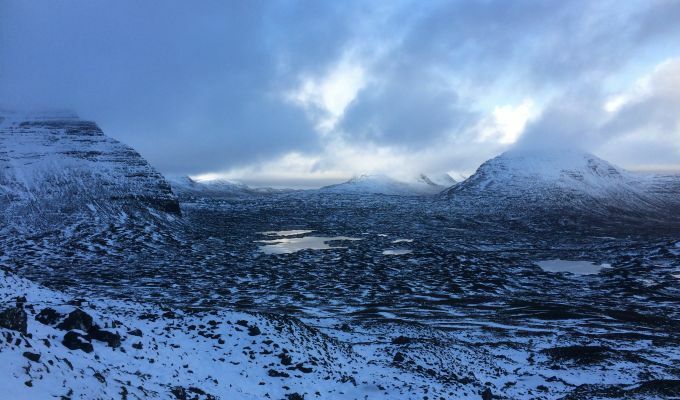 The next day I was joined by my friend Robert for a snowy walk round into Beinn Eighe's Coire Mhic Fhearchair. There were grand views across to the peaks and lochans of Flowerdale but the Triple Buttress was lost to the swirling mists. The timing was out again. A magnificent Torridon consolation lay in store, however. Just before midnight, the skies cleared, revealing the full magnificence of Liathach from our kitched window, a clear moon showcasing its snowy ridge beneath a carpet of stars, towering over the miniscule lights of the row of houses beneath. It was clear for about ten minutes before the cloud started to reclaim its territory, but that was enough for Robert to capture this wonderful image. The timing, for once, had been perfect. I can only hope for more of the same during the journeys ahead.